They say that numbers don’t lie, and Wii Fit takes the top spot due to its incredible popularity during the seventh generation console era. It’s the only fitness title for a home console (Nintendo Wii) to become a top-ten bestseller. 22.67 million and 21.13 million copies of Wii Fit and Wii Fit Plus have sold respectively as of Oct. 2017. 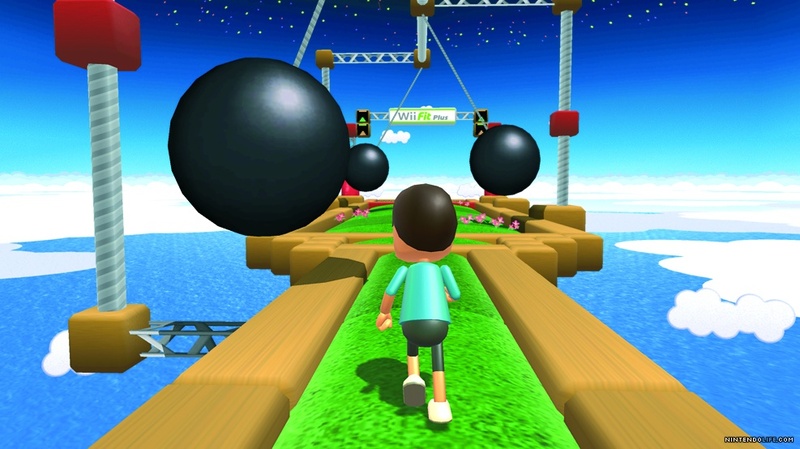 Wii Fit tracks your center of balance, weight and movement via the Balance Board peripheral, so naturally it excels at balance games and yoga. A variety of strength training and aerobic activities are also included. Even over a decade after its launch, there is nothing out there anything like Wii Fit. And over the years, people have found new ways to better lives by using it for physiotherapy rehabilitation and gaming rehabilitation. Since P90X and P90X3 empowers its users to bypass gym membership fees, as well as eliminating the need for an extensive home gym, accessibility is a prime reason it has become astonishingly popular. One of the best aspects of the P90X system is that it challenges you without the need for heavy, expensive equipment. Only a pull-up bar and either resistance bands or dumbbells are required. 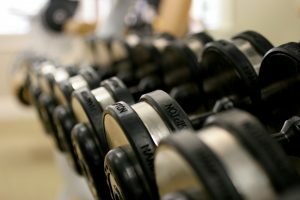 Why Dumbbells Over Resistance Bands? Gym rats claiming that dumbbells are objectively the best choice have it wrong. Studies have concluded that a dumbbell or resistance band with the same weight/resistance rating has the same ability to build and tone muscle. Unlike workout machines, either offers a free range of motion as well. So your movements won’t be restricted in an unnatural manner. The key difference here in terms of function is that with dumbbells you’re lifting against gravity while with resistance bands you’re lifting against tension. Although resistance bands are great for travel, dumbbells are incredibly robust and a quality product can last a lifetime. Although manufacturers such as Bodylastics are beefing up their resistance bands so snapping is less likely, their offerings are made from materials that degrade over time (latex, rubber, etc.). If you’re working out at home why not choose what’s best in the long-term? For best results and to adapt to your current fitness capabilities, you’ll want a wide range of dumbbells at your disposal or adjustable dumbbells. Exercises such as triceps kickbacks require light weights, while others like heavy pants are intended to be executed with heavy resistance. The P90X Fitness Guide suggests using a range of dumbbells starting at 5 pounds and going as high as 70 pounds. You’d need a rack filled with fixed dumbbells (ranging from 5 to 60 lbs.) 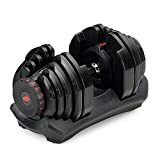 to replace most adjustable dumbbells. So by going with an adjustable model, you’ll save space and if you need a comprehensive set, money too. Adjustable dumbbell brands like Bowflex have gone high-tech. SelectTech 560 includes Bluetooth connectivity which syncs and records sets, reps and the weight used. Results are viewed via the Bowflex SelectTech App. People with plenty of space looking to build a more professional gym at home may prefer the convenience of traditional dumbbells. Rather than pausing the P90X video to change the weight of your adjustable dumbbells, you’ve got the ability to quickly grab what is needed from a rack. Most people however, will be better off going with adjustable dumbbells as they offer a greater value. For more analysis on the characteristics of both fixed and adjustable dumbbells, read the full article here. 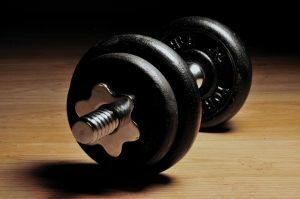 Which Adjustable Dumbbells to Choose? Bowflex and PowerBlock are the most popular makers of adjustable dumbbells, and within these two camps the choices are simple. There is essentially an option for average fitness needs and an amped up version for fitness enthusiasts, power lifters and athletes. 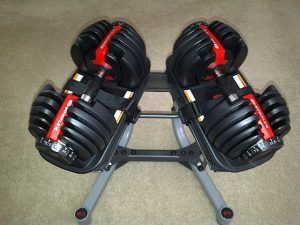 Specifically, the Bowflex SelectTech 552/560 or PowerBlock Personal Trainer Set is for most people, and the SelectTech 1090 or PowerBlock Elite for the highest achievers. On the Bowflex side the SelectTech 560 is the latest model replacing the 552. 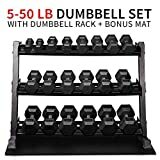 Which Fixed Dumbbells to Get? 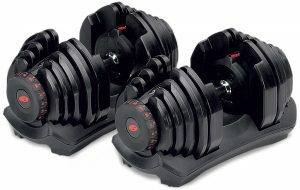 Dumbbell sets for light lifting are commonly encased in vinyl or neoprene. These are commonly intended for women with average fitness goals. Sets with weights above 20 lbs. are fundamentally made of cast iron. 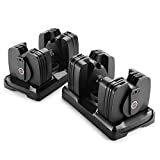 Brands are much less significant in this space compared to adjustable dumbbells, as these are comparably simple products to make. That being said, XMARK and CAP offer quality products and are among the best sellers on Amazon.com. 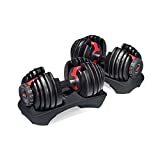 Don’t be fooled by starter fixed dumbbell sets with low price tags, as you’ll easily outgrow these, and the included weights won’t cover what is need to get the most out of P90X or P90X3. Since diet will make or break the result of your workout regimen, it’s surprising that most fitness video programs don’t talk about it at all, or annoyingly go over it just enough to push affiliated supplement products. Autumn Calabrese’s 21 Day Fix program has taken on the ambitious task of teaching you everything you need to know to lose 15 pounds in 21 days. The base kit includes 2 DVDs with exercise routines, a food container system that makes it easier to prevent overeating, and an eating plan that includes basic recipes. For those yearning for more mind-blowing before and after photos or dazzling at an important event, a 3 Day Quick Fix has been included which is primarily intended to be done directly after the 21 day program. Of course the question you’re here to answer is, is it any good? Let’s get to that. Each segment of Autumn Calabrese’s system has been evaluated separately to keep this review tidy as there is a decent bit to cover: videos, eating plan, containers/cup, plus 3 Day Quick Fix. The main attraction is of course Autumn Calabrese’s workout videos. For those unfamiliar with her day job, Calabrese is a celebrity trainer that has helped Rachel Zoe, Brooke Burke, and Tom Bergeron. Also, being a mother of one and fitness competition competitor has given her a unique approach to fitness. To follow the schedule, you’ll do seven 30-minute workouts per week. The first disc contains a full body fix, upper and lower fix, pilates, and abs workout. The second has cardio, dirty 30, yoga and another 10-minute fix for abs. Each exercise is done for a full minute, which is enough time to get your heart pumping. After there is 20 second cool-down in which Autumn talks about and demonstrates the next routine. The pace is pretty easy to keep up with, which is good for beginners, as you won’t dread another day of joint pain or feeling like you’re always a step behind the instructor. The workouts include new and unusual workout routines that are spins on classic maneuvers, such as the one-arm row in plank position. So prepare for some new challenges along the way. It’s estimated that 70% of your results will come from changes in diet. The 21 Day Fix Eating Plan isn’t a fad diet that means eating nothing but fruits and vegetables, or drinking an excess of health shakes. It’s just a balance of healthy foods you’re likely already eating, just less of it. It’s a disciplined diet. However, it’s not so strict that it takes all the fun out of eating. The containers might even encourage you to be creative and come up with healthy treats while keeping true to the rules. If putting a little whipped cream on your fruit salad feels like the reward you need after a hard workout, go with it. Bending the rules within reason might mean the difference completely quitting and getting the results you’ve been yearning for. Very basic meal ideas are included to keep you on track, ex. grilled chicken with steamed veggies and extra virgin coconut oil, or steamed fish with steamed veggies. You won’t be winning any culinary awards with these meals, but the approach works, and less time in the kitchen will make up for the added time in the exercise room. The beauty of the container system is simplicity. You don’t have to count calories or weigh your foods. Instead, each color-coded container is intended for a different type of food, ex. green for veggies, red for proteins. This method may not be totally accurate, but it’s good enough to serve its purpose. The major concern here is if you really need this level of handholding. You could easily measure your foods by volume in a measuring cup then put it into Tupperware you already own. Sure, getting custom containers saves you the measuring step and is idiot-proof, but for some people’s preferences or needs it just adds extra cost. If you prepare your own lunches at home and take it to work, the gym, or elsewhere the idea is worthwhile. For homebodies that aren’t as busy, it’s simply a luxury. This is a jump-start for a leaner, sexier, new you. It’s an eating plan designed to maximize fat loss. Autumn Calabrese developed it based on her own experience so she had that extra edge before competitions or photo shoots. Now you can too! The basic rules are you can eat: streamed veggies, lean white proteins, oatmeal, yams, limes, lemons and spices. You cannot eat/drink Shakeology, fruit, or salt.